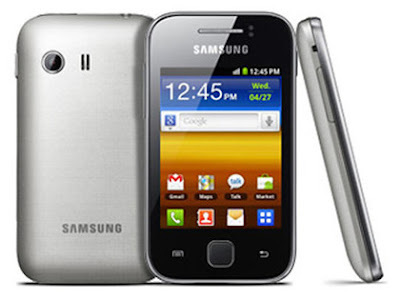 Samsung Galaxy Y Price in India - Rs. 6,600 onwards. Samsung Galaxy Y Price in Mumbai- Rs. 6,600. 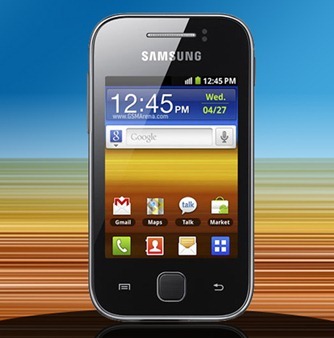 Samsung Galaxy Y is a Full Touchscreen smart Phone by Samsung. It is a Android OS smart phone. it's Features are OS - Google Android 2.3 Gingerbread OS, CPU - 832 MHz Single-Core Processor, Display size 3.0 inch, TFT Capacitive Touch Screen with 320 × 240 pixels, Camera - 2.0 Megapixels with 1600 × 1200 pixels resolution, Audio support Format - MP3, AAC, AAC+, WMA, WAV, MP4, DIVX, WMV, 3GP, 3G2, Adobe Flash Reader, Mobile Dimentions 104 × 58 × 11.5mm, Weight - 97.5 gm, Color - Black.